Covenant Life Church sponsors a large, active, and exciting English school that meets two nights a week at South Lake Elementary School here in Gaithersburg. 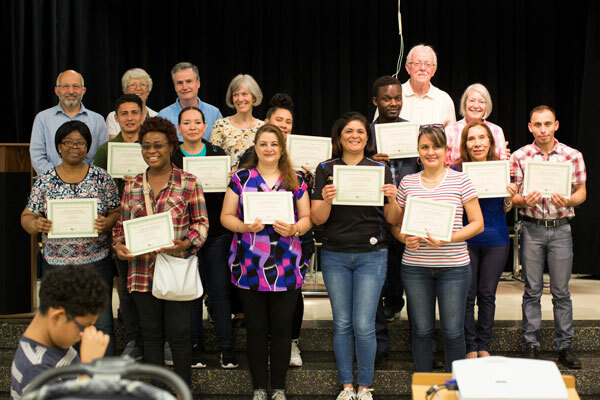 Every Monday and Wednesday, 45 members of Covenant Life Church give up their evenings and make their way to South Lake to teach English to our international neighbors, as part of the church’s ESOL (English for Speakers of Other Languages) program. An additional 15 volunteers serve the English students, teachers and assistants, by watching the children in Joy Club. This past year we had over 220 students representing 20 different countries and 15 different spoken languages. The English students come from all over the world – from West Africa and the Middle East; from South America and Asia. Covenant Life volunteers taught 9 classes and 6 different levels of English – beginner to advanced. More than 80 children participated in Joy Club this year. 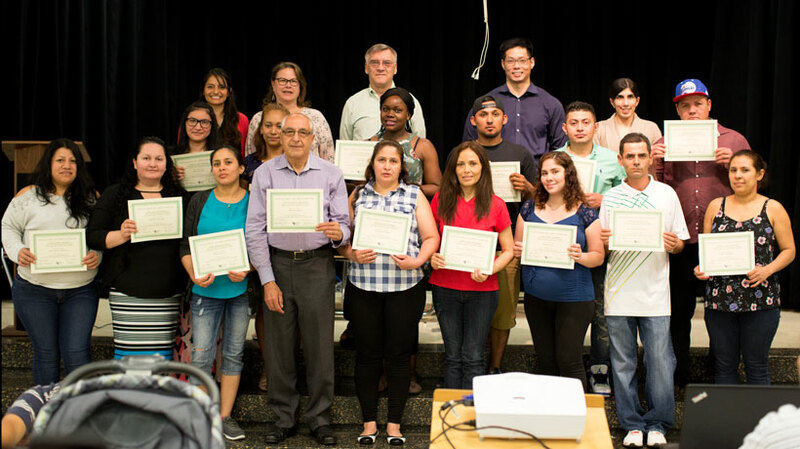 On Monday night, the ESOL program completed its sixth year of serving the South Lake community by holding a large ESOL Graduation celebration. 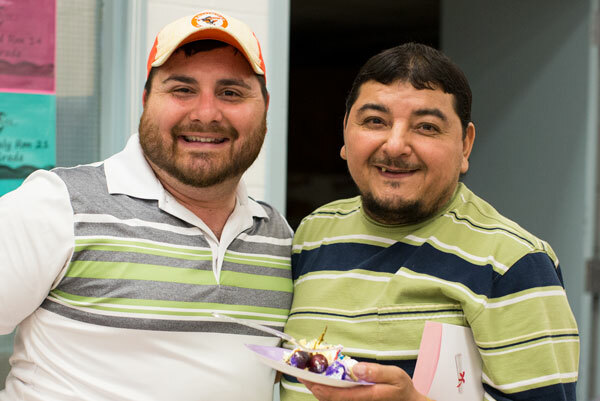 Volunteers and students gathered in the cafeteria at South Lake for a big party to celebrate the student’s hard work and success in studying English during the previous year. Celeste King, principal at South Lake, spoke words of encouragement to the English students, and praised their efforts. Jim and Mary Pat Hand, who teach the Intermediate 2 class, also had the opportunity to give testimony about the great blessing that they have received from meeting their students and serving with the ministry. Daniel Chen spoke to the volunteers and students from Jeremiah 29:11 – encouraging everyone in attendance that God had a plan for them. After hearing special music from student Maria Sanchez and her husband, each student received a special certificate of participation to mark the occasion. In addition, several students received a “most improved” award from their teachers. 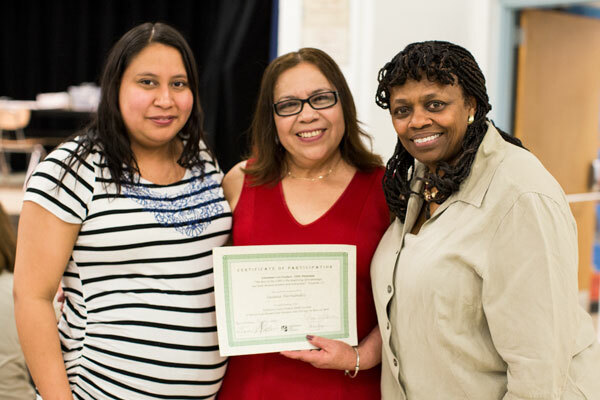 Teachers Dave and Laurie Bright and Joy Club volunteers Maritza Smith received awards for “Most Valuable Volunteer” – for their hard work and commitment to making the ESOL program successful over the previous year. We closed out the night with coffee and cake to celebrate. The night was great fun, and a great success! The ESOL ministry is always looking for new volunteers! Classes are held on Mondays and Wednesday nights for 12 weeks in the fall and spring, and the ministry is expecting over 200 students - along with their children – starting in September. We will be holding our Annual Training on August 17th & 18th, and we hope that you can join us!